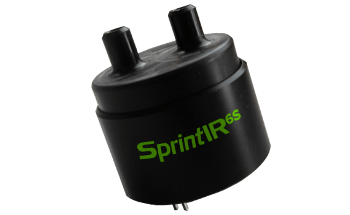 The SprintIR®-W Fast Response CO2 sensor is a high-speed sensor that is suited for applications that require the capture of rapidly changing carbon dioxide concentrations. Operating on a measurement rate of 20 readings per second, the fastest NDIR CO2 sensor in the market. For improved performance, the sensor may be equipped with mechanisms that support either flow-through or diffusion structures. SmartIR technology enables the performance SprintIR®-W CO2 sensor. With the low-power feature of the technology combined with high speed and ruggedness, a reliable NDIR sensor is built. 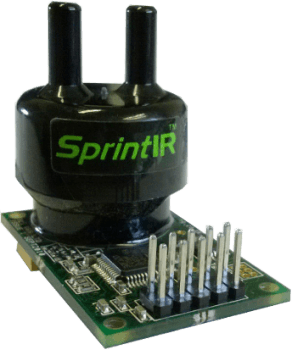 As such, the SprintIR®-W Fast Response CO2 sensor is ideal for use in various working environments, including the medical and aerospace industries. The sensor, including its handheld and battery-powered systems, is also able to withstand harsh environments such as underwater. SST Controls can supply an optional USB to TTL cable that will enable users to attach the SprintIR®-W Fast Response CO2 Sensor to a PC where measurements may be viewed.